Russia-backed militants conducted seven direct fire attacks on Ukrainian forces in eastern Ukraine yesterday, the majority of them involved mortars. Ukrainian servicemen returned fire one time from weapons, not proscribed under the Minsk agreements. “Ukrainian troops incurred no casualties yesterday,” reported Ukrainian Ministry of Defense spokesman on ATO Colonel Maksym Prauta at a press briefing at Ukraine Crisis Media Center. In Donetsk sector, Russian proxies committed four ceasefire violations in the area close to Azov sea. During evening hours, they fired almost twenty 120-mm mortar rounds on Ukrainian positions in the vicinity of Shyrokyne and Vodyane. These attacks started shortly after Ukrainian servicemen noticed militants’ reconnaissance team close to their positions, and a short combat engagement between them. “When the reconnaissance team came critically close to Ukrainian positions, Ukrainian servicemen opened small arms fire. Militants retreated, leaving one of their wounded soldiers at the site. The latter was taken away by our servicemen and received the necessary medical aid,” elaborated the spokesman. In Luhansk sector, militants violated the ceasefire three times. Militants violated the ceasefire two times near Luhanske in Svitlodarsk area. The first attack took place early in the morning and continued for one hour, they fired a total of twenty 82-mm mortar rounds on Ukrainian positions. Militants resumed shelling near Luhanske in the evening, firing eight more mortar rounds, accompanied with heavy machine guns fire. 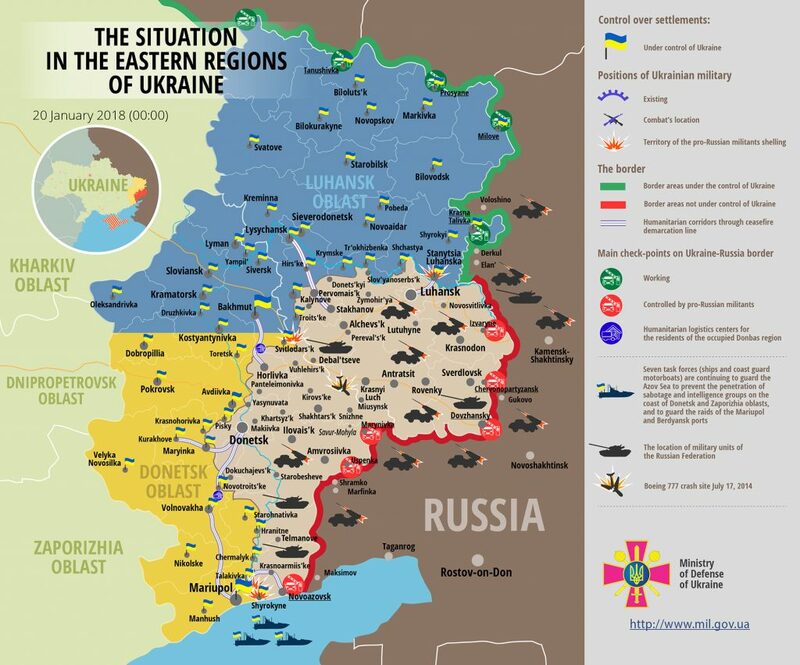 Moreover, militants undertook a short small arms attack near Stanytsia Luhanska in the morning. Repairing of “Vodafone Ukraine” [mobile network operator] equipment near Vesela Hora (Luhansk region) was successfully completed yesterday. “Now mobile connection is available again for all Vodafone customers in areas of Luhansk region not controlled by the government,” noted Col. Prauta. Repairing works were organized in cooperation with the Ukrainian side of JCCC, ATO Staff and OSCE Special Monitoring Mission to Ukraine. “However, all requests of “Vodafone Ukraine” for security guarantees to repair the damaged equipment near Olenivka, Donetsk region, are still waiting for a positive answer. Their requests received security guarantees from ATO Staff and were passed by OSCE SMM to the representatives of the area not controlled by the government. Unfortunately, occupational administration has not provided security guarantees yet,” added the spokesman. Tomorrow, on January 21, army orchestras will play in a number of Ukrainian airports to commemorate and honor the defenders of the Donetsk airport. “At 8.30 am, seven best military orchestras will perform in Kyiv Boryspil Airport, on the 3rd floor of terminal “D”. Similar performances will take place in Dnipro, Zaporizhdzya, Ivano-Frankivsk, Lviv, Odesa, Kharkiv, Chernivtsi and Vinnytsia,” said Col. Prauta. The battle for Donetsk airport terminal continued for 242 days, since 26th of May 2014 until 21th of January, 2015. Report on the military developments as of January 19 is available here. Interactive data on the shelling: chronology shelling chart and the interactive map.